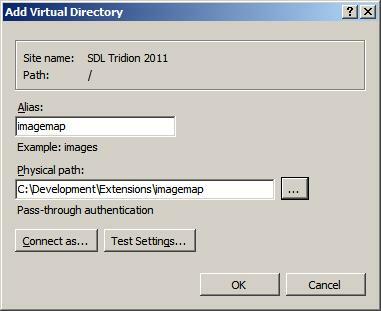 This post is part 3 of 3 that explains how to install the Image Map extension for SDL Tridion. Please also read the image map extension introduction and details about how to use it. Note: This will only work on SDL Tridion 2011, that said it would be really easy to get this working on 2009, contact me if you’d like some help with it. Click here to download the code. 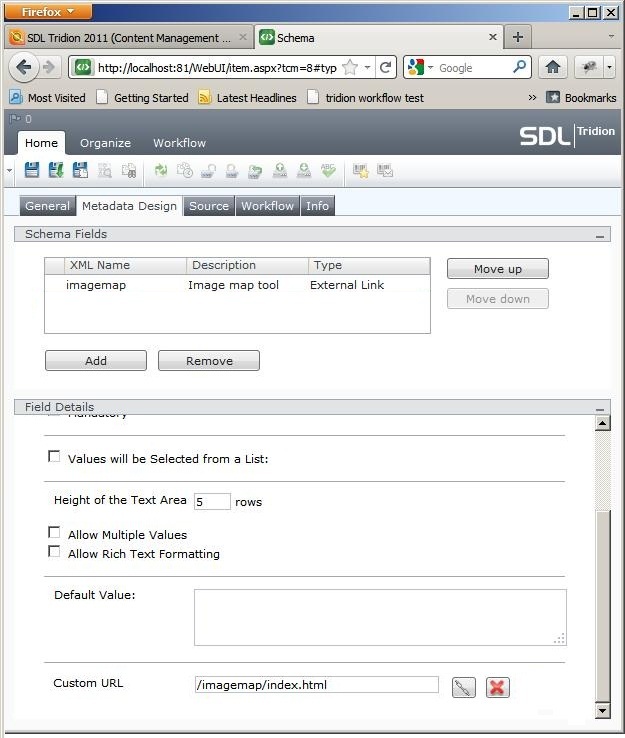 The code must sit on the SDL Tridion Content Manager server, so bare that in mind when downloading. Copy (or move) the \imagemap folder in it’s entirety from the zip file and place it in the on your SDL Tridion Content manager server. Open up IIS and browse the SDL Tridion website. Under the root, create a new virtual directory named ‘imagemap’ ensure the path to the files maps to where you have just placed the image map folder. If it works you should be able to visit the page http://[TRIDION-SERVER-NAME]/imagemap/index.html and see the image map interface. 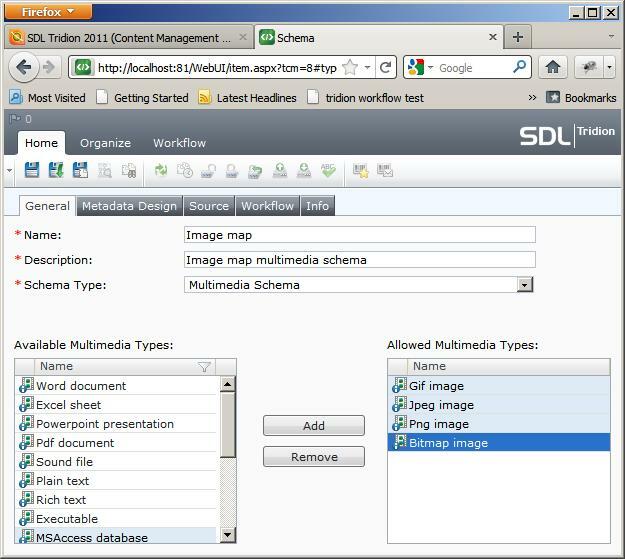 Create a new multimedia schema called ‘Image map’ and allow the image formats as required. Inside the metadata tab, create the new ‘imagemap’ field as a multi-line text field. However many lines you’d like is fine, but do not check the box to allow rich text formatting. Note: If you wish to create additional metadata fields, make sure the imagemap field is always the first field. In the custom URL field enter the path to the imagemap tool ‘/imagemap/index.html’ as shown in the image above. Don’t be tempted to not use the ‘index.html’ part of the URL, as the tool may not work correctly. Now save and close the schema and you’re good to go! Now it’s installed check out the post containing the usage instructions.